So the nice FEDEX man dropped my passport off yesterday with my new, shiny visas for Uganda and Kenya all official and everything. I've been to countries on 4 continents in the last few years (North America, Asia, Australia, Europe) and these are the flashiest visas I've gotten yet. Check 'em out. This is real for me now. 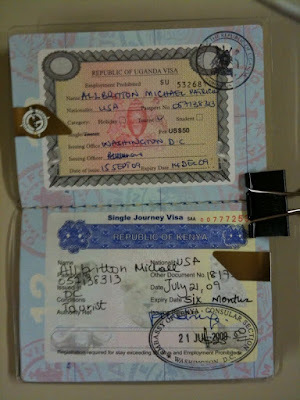 I've been buying camera gear, plane tickets, making reservations, talking with other travelers on discussion boards, reading up on photographing gorillas in the jungles of Rwanda in preparation, but having the visas in the passport to look at, to touch... it's real now. This trip is going to happen. I'm almost vibrating with excitement. Going to Lebanon not long after the Israeli-Hezbolla war in October 2006 was pretty exciting for me. I knew nothing really dangerous was going to happen, but just going to a new place that had been in a war that recently was still exciting. But this trip is a completely new level of excitement. On this trip I'm going to see wild mountain gorillas in their natural habitat! Something very few people are going to get to do. My hopes and goals for my photography are to get a few good shots of the gorillas that I can share; I also want to get at least one good shot each of a rhino (although I don't know if I'll actually see any) and a leopard.